The 4th century Stagira was a small city of Ηalkidiki, which was under the jurisdiction of the king of Macedonia. He was born in 384 BC Aristotle, who was to become one of the most important Greek philosophers of antiquity. After Socrates and Plato, Aristotle was the great philosopher who influenced the thinking of the ancients. He was the first to systematically worked on logic, metaphysics, physics, ethics, political philosophy, zoology, psychology, literature and aesthetics, and have rescued more than 200 titles of works attributed to the great philosopher. Today 2000 years later, the famous Massachusetts Institute of Technology (MIT) has classified Aristotle first in the list of names with the most famous names around the world from 4000 BC to 2010, surpassing Jesus and other eminent people such as Plato, Alexander the Great and Leonardo Da Vinci. A unique park of Aristotle is located at an altitude of about 500 meters, in the historical village of Stagira. It is worth visiting not only for its interesting instruments but lso for the great view to the gulf of Ierissos. The park preexisted and the wonderful location was chosen in 1956 to host the statue of Aristotle, made by sculptor Nicholas, in honor of the great philosopher who was born in Ancient Stagira. The unique interactive instruments were placed there in 2003. They are experimental instruments, operating by rules of physics that are mentioned in Aristotle’s textbooks and especially in the one called “The Naturals and combines recreation, entertainment and education. The tower of Madem Agas is also located there, with the house that was the administrative center of Sidirokafsia mines during years of the Ottoman Empire. Our land is located in the third Peninsula of Ηalkidiki, known as the Gate of Mount Athos. It is the place where the great philosopher Aristotle was raised and taught. We invite you to explore the heavenly coasts, the amazing landscapes, the flavors and discover how the essence of life was really discovered here. The Municipality is the last area of the Greek State before Mount Athos. It is commonly known as Holy Mountain, and it is the most important center of orthodox monasticism since late 10th century and one of the top monuments of the world’s cultural heritage. It occupies the northern part of Halkidiki’s peninsula. Initially, cenobitic monasticism appeared in 963 during Byzantine Empire when the first monastery of Megisti (Great) Lavra was founded. Later on, in 972, the first first “ typicon” was signed which constitutes the Athonite monasticism, bearing the rules of organizing and operation of the cenobitic communities. Avaton, is one of the most ancient and unbreakable rulesm which means, the non-accessibility of Mount Athos to eunuchs, beardless children and women. The 20 “Dominant”, “Royal”, Patriarchal” and “Stavropegial” holy monasteries comprising the Monastic State of Mount Athos, continue to support and spiritually reinforce the Church and the Greek society with the ascetic lifestyle. Many people from all the Christian Orthodox community commute from the Ports of Ouranoupoli, Tripiti and Ierissos in order to visit the monasteries of this sacred land. Every part of the Municipality has its own long history; many parts of it can be seen even today. You can explore ruins of ancient cities, visit castles and byzantine churches or even walk around the neighborhoods of every village, and find the beauty and the grace of a truly blessed land. Ancient Stagira: The most important historic site in Halkidiki is ancient Stagira, located beside Olympiada, is mainly known for being the birthplace of Aristotle, the great Greek philosopher and teacher of Alexander the Great. The tour takes up to 3 hour walk and walking the seaside path, is a must. Ionian settlers who came from the island of Andros founded the city in 655 B.C. while colonists from Chalkida settled a little later on. Xerxes I of Persia occupied it in 480 BC. The city later joined the Delian League, led by Athens. During the Peloponnesian War, Stagira sided with Sparta against the Athenians. In 348 BC, Philip II of Macedon occupied and destroyed the city. In return for Aristotle’s tutoring of his son Alexander, Philip later rebuilt the city and resettled the old city’s inhabitants. When Aristotle passed away in 322 B.C., in Halkida, his body was transferred to Stagira, where he was buried with great honors. He was declared a “founder” of the city and an altar was built on his tomb and established the “Aristoteleia”, a celebration to honor his name. The city was deserted during the Greco-Roman era. Later on a castle under the name Livasdia or Lipsasda is reported, during the medieval era, close to 1000 A.D., located where the ancient city was. The visitor can nowadays see the remains of some buildings on the northern slope of the archaeological site, as well as the small part of the byzantine walling. Canal of Xerxes: It is the largest technical project that took place in Halkidiki during the ancient era. According to Herodotus, in 480 B.C., during the Median wars, Xerxes, the king of Persians, wanted to lead his huge fleet from Akanthos to Thermi (the name of Thessaloniki then) avoiding the danger of the Athonite circumnavigation. So, he ordered the opening of a canal that extended from today’s Nea Roda to Tripiti and connected the gulf of Ierrisos to Siggitikos bay. However, the project of Xerxes looks, probably, like an attempt to impress the residents of Halkidiki and demonstrate power. Although the canal was mentioned in details by Herodotus and Thucydides, it has been an object of dispute by historians. Nowadays, in the landscape there is nothing to remind the huge, ancient construction, apart from a small valley in the center of the isthmus. It is visible from a high altitude, since the place has been suffered subsidence. In 2008, British and Greek engineers made a research that showed the exact location and size of the canal. Ancient Akanthos : was probably founded in 655 B.C stretched in three hills of the Stratoniko mountain, is located near the so called Canal of Xerxes in the Strymonian Gulf, on the root of the Athonite peninsula, in the present gulf of Ierissos and it is stated as a colony of Andros. The walled city of Akanthos was named after the many thorns of the region or after the thorn-formed shape of the fortification. During the visit you attend, the walls of the acropolis, main parts of the city’s fortification, ruins of walls, an impressive part of the acropolis, and scattered architectural parts and structural ruins of the Hellenistic period, public buildings, houses and the foundations of a temple –probably of Goddess Athena- on top of the hill. The city was famous for its wine and salt. In fact, they used to say that the crickets in ancient Akanthos were voiceless. Thus came the famous ancient Greek proverb “Akanthios tettix”. The coins minted by the city are an important addition to its history. They are considered to be some of the oldest and most stylish Greek coins of the ancient era. Underneath Ierissos lies the ancient cemetery of Akanthos. In the center of the city, oppositethe church of St. Nicholas, has been highlighted a small portion of the cemetery is open to the public. The graves are located in three successive levels, dating from the Archaic to the Hellenistic period and belong to all periods of ancient times. The burial gifts, which accompanied the deceased in the afterlife, were usually clay pots, figurines, coins and jewelry. The location of the grave goods were not always the same and the amount or wealth is not correlated with the type of the tomb, but the real or desired social status of the deceased. Zygou Monastery: It is an old Athonite monastery that was founded in the early 10th century and was destroyed just before 1198. It is located approximately 2km east of Ouranoupoli, just outside the limits of Mount Athos. It seems to be one of the oldest monastic institutions on the Athonite peninsula and was discovered in 1984. In the excavation site visitors will admire the castle, the towers and mainly the Catholicon of the monastery which is being excavated. The first report of the name Zygou is made in a 942 document. The first accurate report about its existence was in 992, when it was already an important monastic center with a significant part in the operation of the Athonite state. It seems that the building complex found by the excavations, was built in a century. It is a fiveside castle, fortified by ten or eleven towers. The monastery was abandoned in the late 12th century for unknown reasons and it was granted by a Golden Bull, together with its dependencies, to the reestablished Hilandariou monastery. In around 1206, a Frank lord seems to have settled in the monastery. That is why the remains of the Ancient Akanthos Ancient cemetery of Akanthos monastery were known and are often referred to –in maps also- as Fragokastro. There are marble additions of excellent craftsmanship preserved in good condition on the floors of the Catholicon and the northern chapel, probably work of the 11th century. The most important movable findings are the marble decoration and the marble added, mosaic floors, which are a feature of byzantine architecture. The tower of Prosforio: The symbol of Ouranoupoli, the last “postcard” everyone boarding the ship to Mount Athos takes with him, seems to exist there since the 12th century and is the largest and best preserved tower in Halkidiki. The complex consists of the byzantine tower, the small, fortified yard and the port. It belonged to the dependency of Prosforion (today’s Ouranoupoli) the original core of which already belonged to the Vatopediou monastery in 1018. In an earthquake in 1585 it suffered great damage and that in 1858 it was abandoned. In addition, it was probably burned in 1821, since there are testimonies that in 1858 it was in a terrible condition and abandoned. THE LOCHS: The Australian writer and journalist Joice NanKivelli travelled to Europe to report the events of the 1st world war. She married Scotish journalist and writer Sydney Loch and together they continued traveling around the world offering humanitarian help. In 1928, they decided to settle, to the Prosforiou tower that charmed them. Their largest contribution to the local society was the preservation of the traditional patterns of handmade textiles and how to naturally color the wool. Temple of St. Stefen: The church of St. Stephen in Arnaia, is one of few churches in Greece, that operates normally, serving the needs of the pilgrims, and at the same time is built over important antiquities of priceless historical value, that are visible in their most part.This church, was built in 1812 and honors the memory of St. Stephen, since there was a dependency of the Konstamonitou monastery of Mount Athos. The temple is a three-aisled basilica which was burnt from the ground up during the 1821 Revolution. The residents scattered in the nearby area and returned later in order to rebuild the village and the church, in which they placed a wooden chancel which was a donation from the Konstamonitou monastery. On the night of September 5 of 2005, a great fire broke inside the temple and almost totaly destroyed it, leaving only the stone made walls behind. The evidence of three older buildings was found during reconstruction and renovation of the building. At the same time, many findings, from the christian era until the Ottoman rule period, saw the light of day. Apart from these, fifteen tombs were discovered, some of which are dated in the christian era, whereas others are dated in the 16th century B.C.. The floor of the renovated temple was made of transparent panels, over which the visitor can stand or walk, while observing the enlightened archaeological site and the findings beneath it. Neposi Castle: The castle (Kasteli) is located at the top of a steep slope in the wider area named Neposi, southwest of the settlement. Rough stone and plaster made a fortified wall surrounding that is preserved in a height of 4m, consists of probably three construction phases: One during the Christian era where it was almost destroyed by an earthquake, one during the middle-byzantine era and a probable third, repair phase. The mere nobles’ interest for the castle indicates its importance. It was probably an important link to the defense network of the Byzantine empire, since it is known that Halkidiki, especially during the second half of the 10th century, was a target of Bulgarians. The approach to the walls and the castle is made via a dirt road and a unsigned walk path. Following the main road connecting Palaiochori to Megali Panagia, you will see on your left, in less than 3km the signs for the wider area named Neposi. The customs and traditions of people are the ones that form the character of the place they live in. They are the roots and the unbreakable bonds with the mother land and their ancestors. The Municipality is characterized by the richness of its folklore tradition, a large part of which is occupied by its customs and the events that are organized all around the year. Historical Folklore Museum: The mansion of Iatros, or Iatradiko, has always been one of the most beautiful buildings of Arnaia and the oldest in Halkidiki (it was probably built in the 19th century). After it had been abandoned for years, it was purchased by the Katsaggelos family and next by the National Tourism Organisation, who restored it and passed it on to the Municipality. Nowadays, it houses the Historical and Folklore museum edited by George Katsaggelos, professor in Fine Arts of AUTH. It is divided in 12 sections and a great focus has been given to the photographic material from the life in the village. The residents of Arnaia mainly, have offered the hardware and the tools. Some of those are bread utensils, tubs, agricultural and beekeeping tools, the first radio brought here in 1941, coffee kits, carpenter tools, the famous textiles of Arnaia, utensils etc. The upper floor has an old furnished “ontas” (room). The Weaving museum of Arnaia: There is no better way of learning about the art of weaving and the local tradition than visiting this museum which is housed in a recently restored and specially configured building. The history of the handmade carpets of Arnaia is lost in the depths of time: geometrically classic designs and other techniques recorded in the rest of Macedonia and Thrace, dominate the multicolored rooms. The dominant design is the “calligraphic” Arnaian carpets that are mainly used in the decoration of the walls. The themes come from the designs of cross stitch counters, are influenced by neoclassicism and display themes such as the “chariot of Eos” and from everyday life such as “the shepherdess” etc. The exhibition area of the museum is organized in two levels: In the ground floor you can learn a lot about the process of the raw material’s conversion, such as the wool turning into thread while the showcases display objects and tools related to the process of the preparation of the thread. There are also large rugs or carpets. The first floor contains the “calligraphic” Arnaian carpets as well as other kinds of textiles. Finally, the visitor has the opportunity to see a room decorated with the traditional Arnaian way. Cultural Center of Ierissos: It is housed in an impressive building in the center of Ierissos, since 2004. It was approved by the European Investment Bank as a center for the promotion of the Athonite heritage and the promotion of the Mount Athos area with the use of modern technology. The first attempt was the creation of a high-resolution video titled Travelogue in Mount Athos. In 2010, other movies were also filmed such as the SeaWorld and the Aesop’s Fables. It has a modern amphitheater with a big curved screen 50sq.m. for the projection of 3D movies (that viewers watch wearing special glasses), as well as an exhibition hall. The exhibition hall this period hosts the photo exhibition «Mount Athos: 1000 years in 100 photos». Halkidiki is also known for its awesome beaches. Around the Municipality you can visit all kind of beaches, most of them awarded with Blue Flag, from crowded with great beach bars, to isolated small ones. Discover your dream place and enjoy your ideal place for relax and unwind. 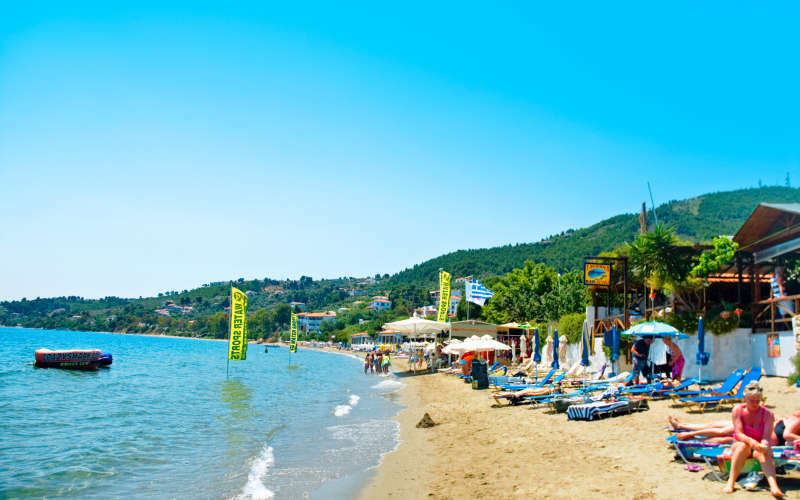 Golden Beach Is located in the northern part of Municipality of Aristotle. All the necessary facilities and services are offered. Proti Ammoudia It offers a beautiful view of the wall of Stagira’s ancient acropolis, a lot of shade from the pine trees and a wooden kiosk that during summer houses a canteen. Gourgourou An extended beach ideal for children, with thin, blonde sand and shallow waters. Pine trees offer their shade. Vina It is located less than 2 km from Olympiada. It is the most extended beach in the area with a tavern and lots of facilities. The pine trees on the back side of the beach offer their shade. Zougla A small downhill road leads to this small and narrow beach with the beach bar Zougla, preferred by the younger people of the region. Kefalas Small beach with turquoise waters by the rocks under the archeological site of Stagira. Access is easy via a path from Proti Ammoudia. Sikia A small beach with thick golden sand and pine trees, under the archeological site of Stagira and beside the port of Olympiada. You can go on foot from Olympiada. Zepkos It is the largest beach of the region and offers no facilities. Some local clubs own a few parts of land that are fenced. It has two entrances from the main road of Olympiada-Stratoni. By the seaside huts for the boats starts the passable dirt road to peninsula’s secret beaches of Vasilitsi, Diavorvo and Marmari an distant exotic beach. Arsanas The beach has big pebbles and rocks all around it, is not organized, not very busy and is located just above Zygou monastery. It is 3 km away from Ouranoupoli. Ouranoupoli Sandy organized beaches with many services provided. They are fully taken care of by the hotels spread on the seaside road. Driving from Ouranoupoli to Tripiti you will find some smaller ones. Xiropotami (Xiropotamos) The famous extended beach of the homonymous settlement, with blonde sand and shallow waters, is ideal for families and kids. It offers view to Siggitikos bay and is located between Tripiti and Kastri. The beach is 8 km away from Ierissos. Kastri Following the dirty road detour from Ierissos to the southern beaches of the Municipality of Aristotle, you will first find this small beach called Kastri. A large rock separates it from Develiki beach. Pyrgos The asphalt road starts from the center of Gomati village and ends -following the left branch at this pebbly beach. A beach bar operates here every summer. Develiki It is one of the most famous beach of the region and has an easy access via an asphalt road from Gomati village. It has blonde sand and pebbles, and is organized at some points. Petalidi The dirt crossroad is located near the stream you come across just before you reach Pyrgos beach from Gomati. After 4 km through slopes full of olive trees you will reach Petalidi. The dirt road is partially rough. There are a few more hidden, quiet beaches in the area around Arkouda cape, easy accessible by boat. Pyrgadikia-Kambos Kambos is the most extended beach in the area and partially organized. You will find it beside Pyrgadikia. Pyrgadikia-Gialakia Gialakia area is a series of three coves you come across when you follow the seaside route from Pyrgadikia to the settlement of Aghios Nikolaos. The largest and best organized beach is the third one. Akti Salonikiou A long coastline with swallow waters and beach-bars, rooms nearby and overlooking the Mount Athos. Stratoni The organized and easily accessible beach is 800m in length. It also provides organized services in all areas. Karvounoskala It is the next beach after the Stratoni beach. A loading ladder used to operate in thearea, hence the name. Kouri Beginning just 4 km after Stratoni, this beach is one of the most quiet and peaceful in the Municipality of Aristotle. Kakoudia Unique formations of white rocks and thick, white sand create an impressive sight. A small sign before you enter Ierissos shows the way to the beach. Nea Roda The seaside settlement of Nea Roda stretches around the beautiful natural “arrow” created by the beach. There are umbrellas, sun beds and all the necessary facilities for the swimmers. Metallio Small, isolated beach full of pine trees and beautiful rocky complexes. It was named after a magnesite mine that operated in the area until the 1960s. Komitsa The northern border to the Holly Mountain at Skopos area marks the end of the busy Komitsa beach. It is one of the longest inthe Municipality. You will find umbrellas and sun loungers at some points. It is located just 5 km from Nea Roda. Ierissos The Municipal camping and summer beach bars that operate on the large and impressive sandy beach of Ierissos. There are lots of facilities such as umbrellas, sun loungers, showers bars and taverns. Apart from the beach bars, there are also taverns and restaurants situated on the long pedestrian street of Ierissos. Megali Ammos The white color of the sand, the crystal clear waters and the sculpted formations of the rocks in its eastern part, make this beach look like a paradise on earth! The view to Ouranoulopi and the island of Drenia is unique. Aghios Georgios A double bay of blonde sand with a few umbrellas las and sun beds, located on the road leading to Megali Ammos. There are cafes, a tavern and a wooden pier. Karagatsia The high slopes on both sides make it look like a refuge with an idyllic beach. There are umbrellas, sun loungers and a wooden deck in the canteen area. Alikes A famous beach and the longest on the island of Ammouliani, with umbrellas and sun loungers in three points. Two of them have a beach bar and at the center are facilities for water sports. Drenia The complex islets of Drenia is east of Ammouliani. Drenia is the largest islet and Feti, Penna, Artemi etc are the smaller ones. Today it is an organized tourist destination with umbrellas, sun beds, tavern-refreshment stand etc. You can go there by boat. Trekking in the Municipality of Aristotle: The region has 6 main walking routes -each one with unique characteristics and historical value. 1. To the borders of Mount Athos. 5km route from the beach of Komitsa to the Zygou monastery and the mountainous borders of Mount Athos. 2. Byzantine walk. 3km route from Ouranoupoli to Zygou monastery and the borders of Mount Athos. 3. Walk of Xerxes. 5,5 km route from Nea Roda to the port of Tripiti and from the settlement of Ammouliani to Megali Ammos. 4. Aristotle walk. 17km environmental route from the Aristotle Park to Ancient Stagira. 5. Mountain walk. 17km route from the settlement of Arnaia to the waterfalls of Varvara. 6. Mademochoria. 5,5km route from the traditional settlement of Arnaia to the Neposi castle of Palaiochori. The waterfalls of Varvara: Near the village of Varvara there are two amazing waterfalls in a forest full of taxus, alders, lindens and wild hazels. Both the location and the feeling of calmness and serenity will make you feel like you have discovered a small paradise. You will notice the two waterfalls entering the ravine, after you have parked your car, you will see the first waterfall from above, whereas in the second one you will feel its momentum even in the summer. It takes a short walk (5-10 minutes) to discover this wonderful place. Both the wooden bridges and the proper marks on the path contribute to the enjoyment of the unique scenery. Mount Cholomondas: This is the second highest mountain of Halkidiki and is located in the eastern and central part of the prefecture. It stretches from Polygyros to Arnaia in a southwestern-northeastern axis and its maximum altitude is 1.165m at the homonym peak. A large part of the mountain has been included in the Network of protected areas Natura 2000. Regarding the flora, it is covered mainly with oak trees. More than 30% of the forested area has been reforested with pines and spruces. The fauna is also rich. One might see a deer, the wild boar, the hare, the wolf, the fox marten, the badger, the weasel to, etc. The area is characterized as important for the avifauna, since raptors such as the Honey Buzzard, the short-toed eagle, the golden eagle, the peregrine falcon and the eagle owl, breed here, while someone can also observe several endemics such as the partridge, the blackbird, or woodpeckers. Gastronomy: Either in the mountains or the magnificent coasts eating around the Municipality of Aristotle will definitely broaden your culinary senses in all the restaurants and traditional taverns. The cuisine tradition varies and differs from village to village. The dishes and flavors are inspired by the variable influences namely from Mount Athos, Mediterranean Sea, the Asia Minor and Pontus area. You can experience the variety of local products, wines, kinds of cheese, plants and herbs of Aristotle mountain and of course the fresh fishery from Ammouliani island, Ierissos, Nea Roda, Pirgadikia and Olympiada.